Learn more about Mack Matress Outlet! Retail sales of mattresses and related items. Specialising in Simmons, Sealy, Serta, and Sterns & Foster factory seconds at about half the price of retail stores. 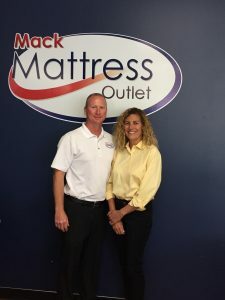 First-Quality mattresses are also available. Our non-commissioned salespeople give the customers a relaxed, no high-pressure shopping experience. Our factory seconds allow the customer to get a high-quality mattress at an affordable price. We operate our business by Christian principles which include honesty, integrity, and care for others. Our desire is to serve our customers in a way that is best for them, not best for us. Why do you advertise in Christian Blue Network? We like to reach out to the Christian community because we are all aspiring to the same purpose. We are a second generation family business that began 43 years ago.